In addition, classes are provided in order to identify lower and upper limits for a dataset based on specific algorithms (such as using percentiles). Identifying lower and upper limits, as well as re-normalizing, is described in the Intervals and Normalization section, while stretching is described in the Stretching section. The stretch functions are similar but not always strictly identical to those used in e.g. DS9 (although they should have the same behavior). The equations for the DS9 stretches can be found here and can be compared to the equations for our stretches provided in the astropy.visualization API section. The main difference between our stretches and DS9 is that we have adjusted them so that the [0:1] range always maps exactly to the [0:1] range. As before, the combined transformation can also accept a clip argument (which is True by default). 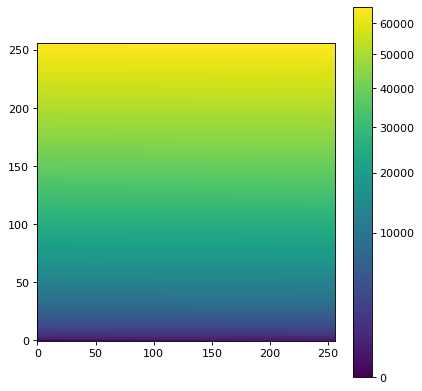 Matplotlib allows a custom normalization and stretch to be used when displaying data by passing a matplotlib.colors.Normalize object, e.g. to imshow(). The astropy.visualization module provides an ImageNormalize class that wraps the interval (see Intervals and Normalization) and stretch (see Stretching) objects into an object Matplotlib understands. As shown above, the colorbar ticks are automatically adjusted. While this is the simplest case, it is also possible for a completely different image to be used to establish the normalization (e.g. if one wants to display several images with exactly the same normalization and stretch).